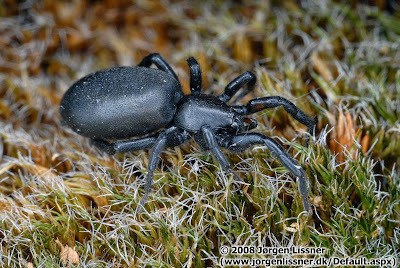 Female Zelotes longipes, photographed by Jørgen Lissner. 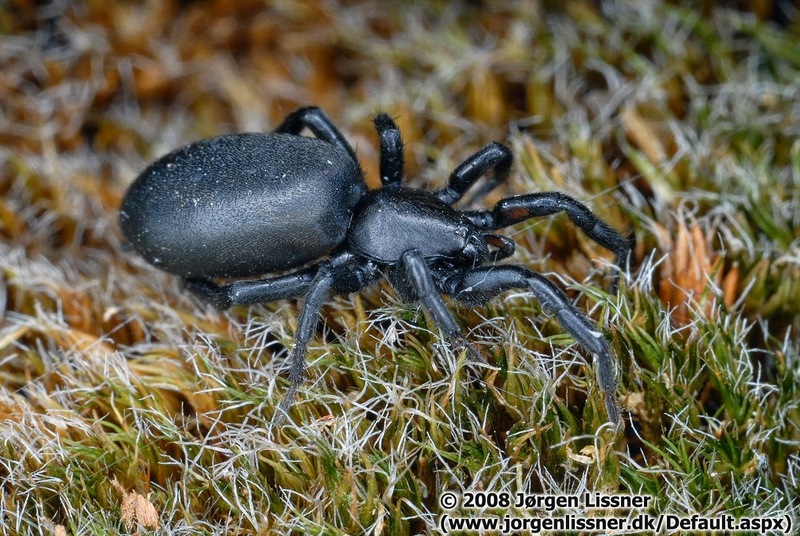 The spider in the photo above is a fairly typical representative of the genus Zelotes. As it currently stands, this is a large genus found worldwide, with around 400 species described so far and new ones continuing to debut at a fair rate of knots. I have no idea why Johannes Gistel, when he named this genus back in 1848, thought it to be especially zealous. My guess would be that there was probably no particular significance to the name; Gistel may have simply chose it in the well-established tradition of the time of providing organisms with classical names. 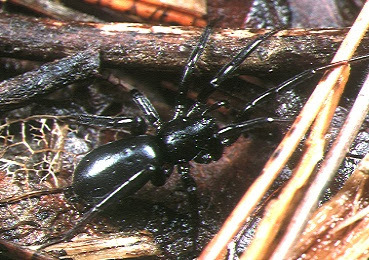 Members of the Gnaphosidae, the family of spiders to which Zelotes belongs, do not construct a permanent web but are ground-running active hunters. 'Running' being the operative word: part of the reason why new gnaphosid species continue to be described even from well-populated parts of the world is that, if you want to describe them, first you have to catch them. Zelotes species seem to be generalist in their habitats, with members of a single species found in a wide range of environments. 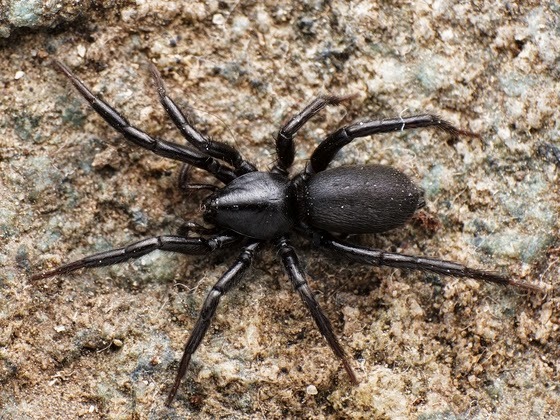 Gnaphosids are something of a notoriously difficult group of spiders to identify, and Zelotes is no exception. Distinguishing features of Zelotes include the presence of a ventrodistal comb of stiff hairs on the metatarsi of the third and fourth pairs of legs, used in preening; the posterior median pair of eyes being roughly similar in size to the outer posterior eyes (gnaphosids have eight eyes in two rows of four); and the presence of an extra sclerite in the male genitalia (Ubick 2005). The genital sclerite was recognised as an important characteristic of the genus by Platnick & Shadab (1983), but their review was mostly restricted to North American species. Many species in other parts of the world remain unrevised, and future studies may affect their placement in Zelotes. Female Zelotes iriomotensis, photographed by Akio Tanikawa. Female Zelotes fratris, photographed by Kyron Basu. In general, the myriad Zelotes species can only be distinguished by examination of their genitalia. Most of us would be doing well to even identify it as a Zelotes. Platnick, N. I., & M. U. Shadab. 1983. A revision of the American spiders of the genus Zelotes (Araneae, Gnaphosidae). Bulletin of the American Museum of Natural History 174 (2): 97-192. Ubick, D. 2005. Gnaphosidae. In: Ubick, D., P. Paquin, P. E. Cushing & V. Roth (eds) Spiders of North America: an identification manual, pp. 69-74. American Arachnological Society. A footnote to go with the asterisk after "classical names" appears to be missing. It was going to go to an exceedingly lame joke, but I decided it was too stupidly contrived (I was considering bewailing that the genus had not been named by Simon, so I couldn't cite it as 'Zelotes Simon'). I just forgot to remove the asterisk. Liddell-Scott has ζηλωτής as "emulator, zealous admirer or follower". Perhaps the author was referring to the spider being very like others? Are the north American species or one similar known for furtively biting people? From about January through March I kept getting bitten on my lower calf and feet while none of the usual suspects like mosquitoes and fire ants. The effects of the bite was unusual in that the itch was incredibly intense, but extremely short lived and all but gone after 5 minutes or so. As hard as I tried the only thing I ever saw was arapidly running very tiny dark spider in the process of disappearing. I figured I must have been seeing things, because I had understood those little spiders never bite people. As soon as the weather warmed up, the biting stopped, and after that when I was bitten I knew it was a red ant or mosquito. I had forgotten about it, until the photo of N.A. Zelotes made me instantly remember that frustrating experience. A Spider Did Not Bite You. It's pretty much impossible to identify what sort of animal bit someone after the fact, but if it was happening repeatedly it was almost certainly not spiders. Some spiders may bite in self-defense, but they don't feed on people. Also, there are many other sorts of injury that people may mistake for arthropod bites, such as scratches or allergic reactions.